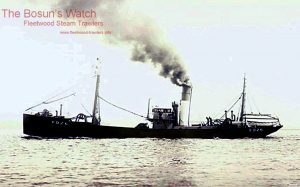 25.8.1914: Launched by Smith’s Dock Co Ltd, South Bank-on-Tees, Middlesbrough (Yd.No.587) for Sleights’ Steam Fishing Co Ltd (64/64), Grimsby as SAMURAI. 9.1914: Completed. Price £7,487. (Cost to build £7,244 (machinery £2,745), profit £243). 21.9.1914: Ernest Sleight designated manager. 23.9.1914: Registered at Grimsby (GY175). 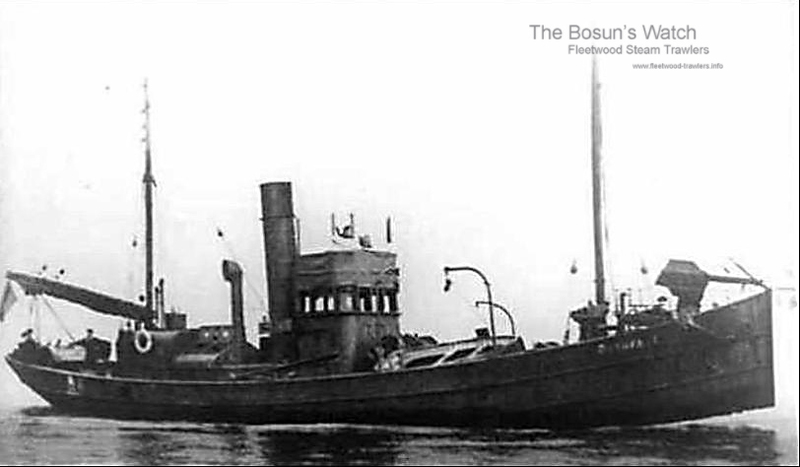 26.9.1914: Vessel mortgaged (64/64) to Barclay & Co Ltd, London (A). 12.5.1915: Vessel mortgaged (64/64) to National Provincial Bank of England Ltd, London (B). 8.1915: Requisitioned for war service (Ad.No.1443). Fitted with 1-6pdr HA and mine-sweep. Based Lowestoft. 8.4.1918: Mortgagee re-styled National Provincial & Union Bank of England Ltd, London. 1920: Returned to owner at Grimsby. 15.9.1921: Sir Ernest Sleight, Bart designated manager. 15.2.1924: Mortgagee restyled National Provincial Bank Ltd, London. 19.10.1927: Vessel mortgaged (64/64) to Walter Harold Beeley, Grimsby for the sum of £4,000 with interest at 6% (C). 13.7.1919: Transfer of mortgage (C) to Margaret Isabel Beeley, Grimsby. 12.10.1937: Mortgage holder became Mrs Margaret Isabel Roger, Woodhall Spa. 4.7.1938: Sold to Ora Trawlers Ltd (64/64), Fleetwood. 6.7.1938: Sydney Leech, Rossall Beach, Cleveleys designated manager. 5.7.1938: Vessel mortgaged (64/64) to District Bank Ltd, Manchester (D). 23.3.1941: On St. Kilda ground, bombed and strafed by German aircraft, suffered damage. 15.8.1952: Vessel mortgaged (64/64) to Amy Beatrice Leech, Thornton Cleveleys for the sum of £2,500 with interest at 5% (E). 14.4.1954: Last landing at Fleetwood, 232 boxes 20 baskets, grossed £1,207. 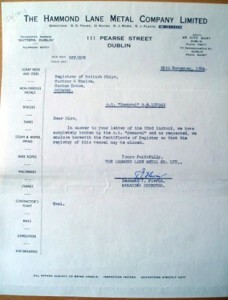 4.1954: Sold to The Hammond Lane Metal Co Ltd, Dublin breaking up. 27/01/2009: Page published. 8 Updates since then. 27/11/2017: Removed FMHT watermarks from images. This entry was posted in Steam Trawlers, Steamers (Picture) and tagged Ora Trawlers Ltd on January 27, 2009 by Fred Smith. 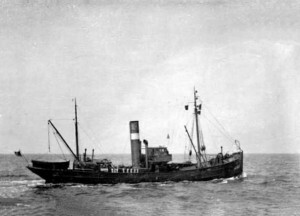 12.5.1914: Launched by Smith’s Dock Co Ltd, South Bank-on-Tees, Middlesbrough (Yd.No.567) for The Staretta Fishing Co Ltd, Fleetwood as CERESIA. 6.1914: Completed (Magnus B. J. Wedum, manager). 23.6.1914: Registered at Fleetwood (FD26). 23.11.1914: Requisitioned for war service as a minesweeper (1-12pdr, 1-7.5” A/S Howitzer) (Ad.No.194). 25.11.1914: Arrived Devonport for fitting out (VIVID II) Fitted as Leader. 28.1. 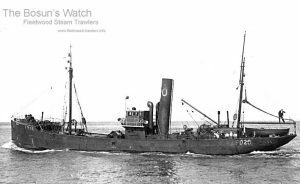 – 13.2.1915: With minesweeping trawlers ROSE II (Ad.No.592) (GY312) and WALTHAM (Ad.No.689) (GY303) detached to Morecambe Bay. 12.3.1915: At Belfast & Larne (VALIANT II). 1.6.15: At Belfast & Larne (HERMIONE). 1.1.1916: At Belfast & Larne (THETIS). 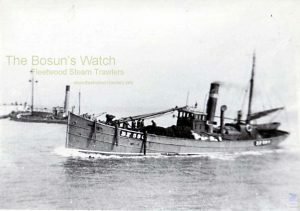 6.9.1918: Sold to The Palatine Steam Trawling Co Ltd, Fleetwood (Magnus B. J. Wedum, manager). 27.9.1921: Registered at Fleetwood as CHORLEY (FD26). 17.5.1930: On grounds off St. Kilda, abandoned fishing due to weather. Passing island observed signals, entered Village Bay and islanders rowed out to ask to relay a message for assistance as a 22-year-old woman, Mary Gillies, was seriously ill. Trawler asked by Scottish Board of Health, Edinburgh to go to Leverburgh, Harris to pick up Dr Alexander Shearer and George Henderson from the Board of Health; owners approved. 17.5.1930: Just before midnight arrived off St. Kilda but conditions in Village Bay very rough. 18.5.1930: At about 10.00 am. doctor and health inspector transferred to shore. Storm bound. 19.5.1930: Mary Gillies, suffering from a form of TB, assessed as too ill to be moved. Doctor and health official embarked and returned to Leverburgh. 21.7.1930: Mary Gillies died at 5.55am. attended by Williamina Barclay the resident nurse; ten weeks after being seen by Dr. Shearer. 20.3.1931: Arrived Oban making water in forepeak. 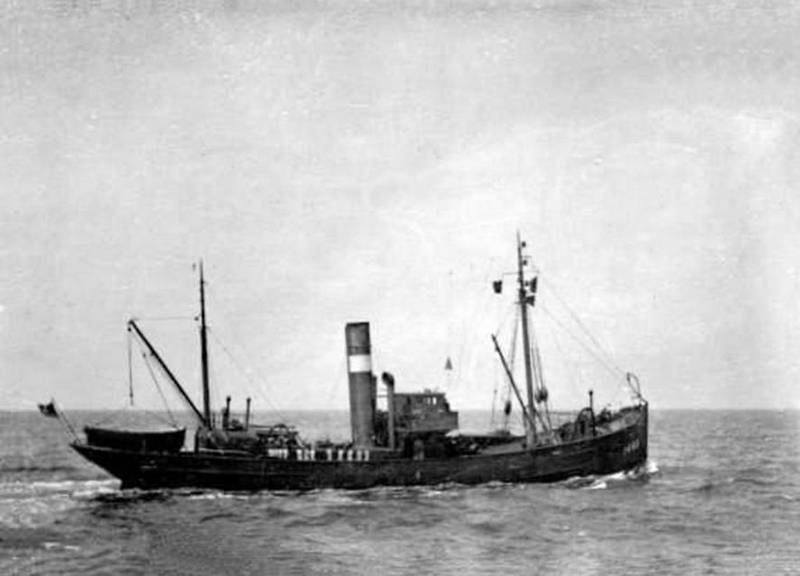 21.12.1932: Stood by and attempted to refloat steam trawler VELIA (FD49) stranded two miles S of Point of Ayre, IoM. 1936: Sold to Ora Trawlers Ltd, Fleetwood (Sydney Leech, manager). 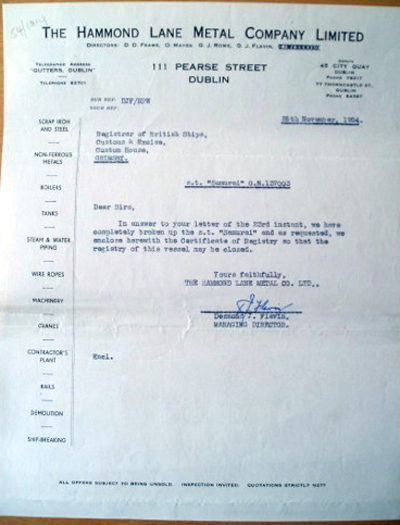 25.1.1940: Requisitioned for war service as a boom gate vessel (P.No. Z.153) (Hire rate £75.14.8d/month). Based Plymouth (Ty/Boom Sk. Albert James Beckett RNR). 24.4.1942: Loaded boom material at RN Boom Depot, Turnchapel for transfer to Dartmouth and to relieve HM Trawler WESTLYN (P.No.Z154) (FD4) as Gate Vessel. 25.4.1942: At 0615 sailed for Dartmouth astern of minesweepers, Senior Officer (Lieut. W. F. Turner RNVR) in HM Trawler BILSDEAN (P.No.FY.503) (GN15) (not attached to them by Sailing Order). At 0830 in fresh weather started to take in water in fore messdeck through skylights, leaking deck seams and rivets, shell plating below bulwark, starboard side *, ventilators and later when down by the head, through main hatch. Under direction of Coxswain fore messdeck baling but water level increasing. Skipper informed. At about 1530, following a reduction in speed, Senior Officer asked what was wrong and Sk. Beckett replied ‘a hot bearing’, making no mention of leaks and flooding. BiILSDEAN turned and came up to vessel which by now was listing to port and well down by the head. At 1615 foundered by the head off Start Point (wreck in position 50.9W 3.38W). Twenty survivors and two bodies picked up and landed Dartmouth. Note +: George Henderson was the compiler of a critical report on the situation at St. Kilda and the health of the remaining residents. This report acted as a catalyst and was used in support of a petition to the Government by the remaining 36 inhabitants to be evacuated to the mainland. Evacuation of the island took place on 29 August 1930. Note *: In Feb 1941 involved in collision with steam tender SIR FRANCIS DRAKE (478grt/1908) sustaining damage to starboard cable trough and plating. This was repaired at refit in Falmouth in Sept 1941 but bulwarks were buckled on the starboard side and this damage was not made good. 21/01/2009: Page published. 9 updates since then. 09/11/2017: Removed FMHT watermarks from images. This entry was posted in Lost Vessels, Steam Trawlers, Steamers (Picture) and tagged Lost, Ora Trawlers Ltd, Palatine STC, Staretta SFC, Wyre on January 25, 2009 by Fred Smith. 5.3.1912: Launched by Cochrane & Sons, Selby (Yd.No.514) for The Western Steam Trawling Co Ltd, Milford Haven as EXMOUTH. 25.4.1912: Completed (Sydney M. Price, manager). 20.4.1912: Registered at Bristol (BL16). 8.1914: Requisitioned for war service as a minesweeper (1-3pdr) (Ad.No.146). 9.10.1914: Based HMS Vernon Portsmouth. Employed on minesweeping training (Lieut. G. K. Courtis RN). Post 12.3.1919: Returned to owner at Milford Haven and reverted to EXMOUTH (BL16). 7.1919: Sold to Vulcan Steam Trawlers Ltd, Fleetwood (Joseph A. Taylor, manager). 26.7.1919: Registered at Fleetwood (FD336). 1.5.1925: Sold to Ora Trawlers Ltd, Fleetwood (Magnus B. Wedum, managers). 16.2.1930: Arrested by HMS LIFFEY trawling within the Isle of Man three mile limit. 14.3.1930: At the High Bailiff’s Court, Douglas, Sk. William Arthur Stanley was fined £50 with costs. 8.1.1933: Off Point of Ayre at about 3.45 am run into by Liverpool steamer MIRIAM THOMAS (430g/1920) sustaining damage to port quarter. 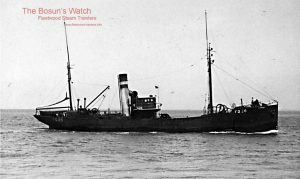 6.6.1933: In the evening in thick fog 2 miles NW of the Point of Ayre, Isle of Man in collision with CEVIC (FD7) sustaining damage to stem and bow plating. Midnight arrived Fleetwood. 17.4.1937: Company changed address in Fleetwood. 2.3.1938: Sailed Fleetwood for West of Scotland grounds between Inishtrahull and Dhuheartach Light (Sk. Ernest Edwards); eleven crew. 9.3.1938: Decided to change grounds and at 1.15 a.m. departed for fishing grounds in the neighbourhood of Otter Rock. In a heavy swell from the westward and strong westerly wind set course S.1/2 W. for Oversay Light. At 4.5 a.m. in thick swirling mist stranded at Smaull Point, west coast of Islay, about 9 miles north of Oversay (55.491/4N 6.271/2W) about 50 yds from shore. Attempted to refloat with engine and lowered boat but making water in engine room. Boat damaged and vessel listed with waves breaking over. Wreck seen from farmhouse window by local girl, Margaret MacFayden, who roused household and cycled four miles to Machrie to warn coastguards. Crew fired rocket line and assisted ashore by local men led by William MacEarchern; three crew lost*. Port Askaig lifeboat launched but on arrival vessel was abandoned and breaking up. 24.3.1938: Declared total loss. Fleetwood registry closed. 16.5.1938: At the BOT Formal Investigation (No.S.395) held at Fleetwood, the Judge concluded that the stranding and subsequent loss would appear to be attributable to the conduct of the Bosun, John Sumner, who lost his life; Sk. Ernest Edwards was found not to blame. The Assessors did not sign the report. 17.5.1938: It was the opinion of the Assessors that the Skipper failed to realise his responsibility for the safe navigation of the vessel and in so doing was responsible for the stranding. It was their opinion that his ticket should be suspended for 9 months. The Board of Trade awarded a binocular glass to Mr Wiiliam MacEarchern for leadership and courage displayed in connection with the rescue of the crew on 9 March 1938 and monetary awards to Mr Allan MacEarchern, Mr Donald MacLellan, Mr James Brown and Miss Margaret MacFayden. 21/01/2009: Page published. 3 updates since then. 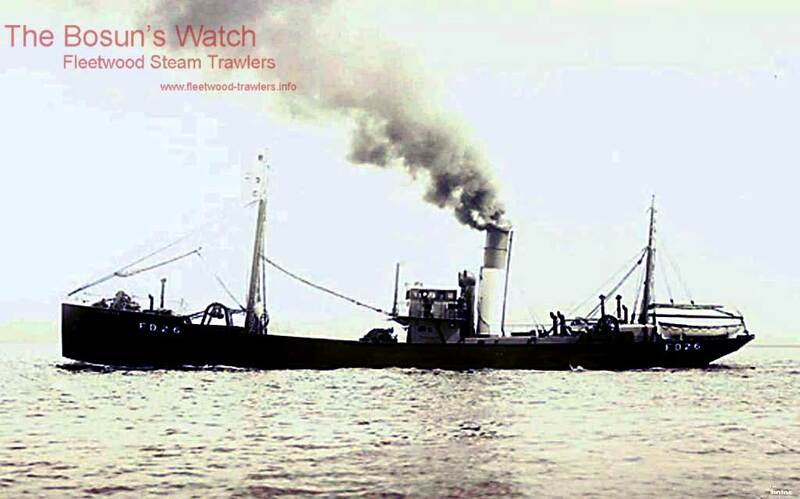 This entry was posted in Lost Vessels, Steam Trawlers, Steamers (Picture) and tagged Lost, Ora Trawlers Ltd, Vulcan Steam Trawlers on January 21, 2009 by Fred Smith. 1918: Launched by Colby Brothers Ltd, Lowestoft (Yd.No.94) (“Admiralty drifter”) for The Admiralty as OVERFALL (Ad.No.3990). 29.10.1918: Completed as a minesweeper. 8.11.1918: Sailed Devonport for Mediterranean. 27.5.1921: Transferred to Ministry of Agriculture & Fisheries, London and placed on sales list. 1921: Sold to John Mair, Portsoy (managing owner). 3.12.1921: Registered at Banff (BF590). 28.11.1939: Requisitioned for war service as a minesweeper (P.No.FY.984) (Hire rate £32.0.0d/month). 30.5.1940: Sailed Yarmouth with twelve other drifters for Ramsgate (Sk. Donald Miller). 31.5.1940: Sailed Ramsgate for Dunkirk (Operation Dynamo). Assisted in evacuation. 1.1942: At Lowestoft as LL drifter. 10.1943: Employed on harbour defence patrol. 1.1.1944: Sold to Yolland & Llewellin, Milford Haven (John C. Llewellin, manager) for £3250. 3.1944: Employed on miscellaneous naval duties & balloon barrage. 7.1945: Sold to J. S. Yolland & Co Ltd, Milford Haven. 16.7.1945: Registered at Lowestoft (LT76). 10.1945: Returned to owner. Fishing from Lowestoft. 1.1.1946: Messrs Yolland & Llewellin partnership dissolved. 1.1946: Sold to Yolland Bros Ltd, Milford Haven (John Yolland Jnr, manager). 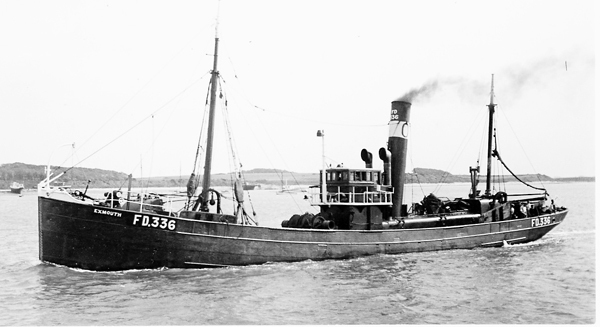 1946: Sold to Cairo Fishing Co Ltd, Milford Haven (John Yolland, manager). 24.7.1947: Fishing out of Milford. 1954: Sold to Yolland Brothers Ltd, Milford Haven. 1954: Sold to George A. Leech, Fleetwood (managing owner) (Ora Trawlers Ltd) for £2225. 3.6.1954: Last landing at Milford. 26.6.1954: First landing at Fleetwood, 37 boxes 10 baskets grossed £243. 10.1955: Sold to BISCO and allocated to Thos. W. Ward Ltd, Sheffield for breaking up. 1958(1960? ): Lowestoft registry closed on discharge of mortgage. 03/01/2009: Page published. 4 updates since then. 09/04/2018: Removed FMHT watermark from image. This entry was posted in Drifter/Trawler, Steam Trawlers, Steamers (Picture) and tagged Admiralty Drifter, Drifter/Trawler, Ora Trawlers Ltd on January 3, 2009 by Fred Smith.